Turkey's foreign policy and the rhetoric that presumably went to support it, has, during the past several years, aimed less at achieving foreign policy goals and more at consolidating voters' support for the Ankara government. Self-aggrandizing behavior has predominantly shaped policy and functioned to please the Turks' passion for a return to their glorious Ottoman past. Assertive and confrontational diplomatic language and playing the tough guy of the neighborhood may have helped garner popular support for President Recep Tayyip Erdogan and his Justice and Development Party (AKP), but after years of "loud barking and no biting," Turkey has effectively become the victim of its own narrative. Confrontational diplomacy has helped garner popular support for Erdogan. In 2010, Turkey froze diplomatic relations with Israel and promised "internationally to isolate the Jewish state," and never to restore ties unless, along with two other conditions, Jerusalem removed its naval blockade of Gaza to prevent weapons from being brought in that would be used to attack Israel. Turkey's prime minister at the time, Ahmet Davutoglu, said Israel would "kneel down to us." In 2016, after rounds of diplomatic contacts, Turkey and Israel agreed to normalize their relations. The blockade of Gaza, to prevent shipments of weaponry to be used by Gazans in terror attacks remains in effect. In 2012, Davutoglu claimed that Syrian President Bashar al-Assad's days in power were numbered, "not by years but by weeks or months." In 2016, Davutoglu had to step down as prime minister, but Erdogan's and his worst regional nemesis, Assad, is in power to this day, enjoying increased Russian and Iranian backing. In 2012, Erdogan said that "we will soon go to Damascus to pray at the Umayyad mosque" -- a political symbol of Assad's downfall and his replacement by pro-Turkey Sunni groups. That prayer remains to be performed. In November 2015, shortly after Turkey shot down a Russian Su-24 military jet and cited violation of its airspace, Erdogan warned Russia "not to play with fire." As for the Russian demands for an apology, Erdogan said it was Turkey that deserved an apology because its airspace had been violated, and that Turkey would not apologize to Russia. Erdogan's Turkey has done more than enough to show that its bark is worse than its bite. In June 2016, just half a year after Russia imposed a slew of economic sanctions on Turkey, Erdogan apologized to Russian President Vladimir Putin. Erdogan and his government have countless times warned the United States not to side with the Syrian Kurds --whom Turkey views as a terrorist group-- in the allied fight against radical jihadists of ISIL's Islamic State. In March 2017, Washington denied that Syrian Kurds were a terrorist group and pledged continued support for them. Erdogan's Turkey has done more than enough to show that its bark is worse than its bite. Yet it keeps barking badly. This time, the enemy to bark at, not bite, is Europe. This is the first time that Erdogan is openly challenging a concerted European stand. In a recent row between several European capitals and Ankara over Erdogan's ambitions to hold political rallies across Europe to address millions of Turkish expatriates, the Turkish president said he would ignore that he was unwelcome in Germany and would go there to speak to his Turkish fans. 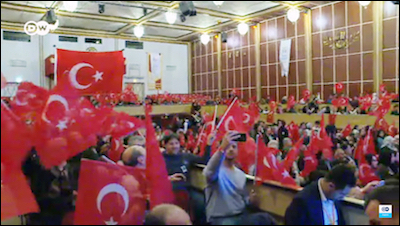 Hundreds of Turkish expatriates in Germany listen to Turkish Sports Minister Akif Cagatay Kilic at a political rally in March 2016. In response, the Dutch government deported one of Erdogan's ministers who had gone uninvited to the Netherlands to speak to the Turkish community there. Germany launched two investigations into alleged Turkish spying on German soil. Similarly, Switzerland opened a criminal investigation into allegations that Erdogan's government had spied on expatriate Turks. In Copenhagen, the Danish government summoned the Turkish ambassador over claims that Danish-Turkish citizens were being denounced over views critical of Erdogan. The barking kept on. In Turkey, Erdogan warned that Europeans would not be able to walk the streets safely if European nations persist in what he called "arrogant conduct." That comment caused the EU to summon the Turkish ambassador in Brussels to explain Erdogan's threatening language. Farther east, in the rich European bloc, several hundred Bulgarians blocked the three main checkpoints at the Bulgarian-Turkish border to prevent Turks with Bulgarian passports, but who were living in Turkey, from voting in Bulgarian elections. The protesters claimed that Turkish officials were forcing expatriate voters to support a pro-Ankara party. Meanwhile, at the EU's southeast flank, Greece said that its armed forces were ready to respond to any Turkish threat to the country's sovereignty and territorial integrity. What happened to Erdogan's promised "bite" that he could go to Germany to speak to the Turkish community despite repeated German warnings that he would not be welcome? "I will not go to Germany," he said on March 23. 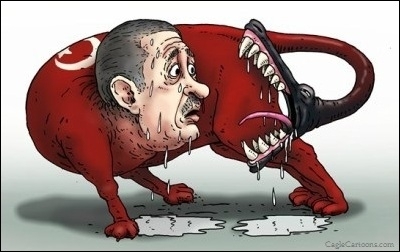 Erdogan may be winning hearts and minds in Turkey with his neo-Ottoman Turkey "barks." But too few foreign capitals find his threats serious, too few politicians think that he is convincing and too many people tend to believe Turkey's bark is worse than its bite. The recent wave of European constraints against Erdogan shows that, for the first time in recent years, Europe does not seem to fear Erdogan's bluffing and thuggishness. At the moment, Erdogan's priority is to win the referendum on April 16 that he hopes will change the constitution so that he can be Sultan-for-life. Picking fights with "infidel" Europeans might help him garner more support from conservative and nationalist Turks. When the voting is done, however, he will have to face the reality that an alliance cannot function forever with one party constantly blackmailing the other.